Wanda Ventham (born 5 August 1935) is an English actress, known primarily for her role as Colonel Virginia Lake in the 1970s science-fiction television series UFO, and for her recurring role as Cassandra Trotter's mother Pamela Parry in the sitcom Only Fools and Horses from 1989–92. She also appeared in two episodes of The Saint alongside Roger Moore. In April 2014, People magazine featured her in its "Most Beautiful People in the World" edition. Ventham was born in Brighton, the daughter of Gladys Frances (née Holtham) and Frederick Howard Ventham. Originally aspiring to become an artist, she attended art school for a year, whilst working as a scenic painter for the Connaught Theatre, in Worthing, West Sussex, during her school holidays. The exposure to professional theatre prompted her to leave art school and pursue a career in acting. She trained at the Central School of Speech and Drama, alongside Judi Dench, graduating in 1956. Ventham's first film role was in My Teenage Daughter (1956), with Anna Neagle and Sylvia Syms. She also appeared in Carry On Cleo (1964) and Carry On... Up the Khyber (1968). She starred alongside Mark Burns in the mystery film, Death is a Woman (1966). Her best known role was on television as Col. Virginia Lake, second in command to Cmdr. Ed Straker (Ed Bishop) in the cult series UFO. Ventham's numerous other TV credits include regular roles in Heartbeat as Fiona Weston, Hetty Wainthropp Investigates as Margaret Balshaw, and The Rag Trade as Shirley. She also played a love interest for Arthur Daley in Minder, Susan's mother in Coupling, and Deborah's mother in Men Behaving Badly. She appeared in the lead role in the 15-part BBC series The Lotus Eaters (1972–73), opposite Ian Hendry, and made a guest appearance in Rutland Weekend Television. She was in an episode of Danger Man, and the series Patrick McGoohan completed immediately afterwards – the allegorical spy series The Prisoner – as well as the sitcoms Executive Stress and Next of Kin, and the sketch show The Two Ronnies. She has appeared in Doctor Who on three occasions over three decades: as Jean Rock in The Faceless Ones (1967), as Thea Ransome in Image of the Fendahl (1977) and as Faroon in Time and the Rani (1987). Her appearance in Image of the Fendahl was opposite Denis Lill. Ventham and Lill would later play Pamela and Alan Parry in the sitcom Only Fools and Horses. In 2014, she and her husband Timothy Carlton appeared in the BBC adaptation of Sherlock as the parents of Sherlock Holmes, who is played by their son Benedict Cumberbatch. Ventham appeared in Holby City as Sheilagh Chiltern, the grandmother of Lofty Chiltern. Ventham married her first husband James Tabernacle in 1957 and they had one daughter, Tracy. They were divorced on 12 November 1974. She met actor Timothy Carlton in 1970 while filming sequences for the drama series A Family at War and they have been married since April 1976. The couple appeared together in the second series of BBC drama The Lotus Eaters in 1973, and in the third and fourth series of BBC's Sherlock in 2014 and 2017, where they played the title character's parents. Their son, actor Benedict Cumberbatch, played Sherlock. 1968 The Blood Beast Terror Clare Mallinger Ventham also provided stunt work for the film and appeared in costume as the giant moth monster. 1971 Thirty-Minute Theatre Jasmine "Walt, King of the Dumper"
^ a b Ancestry.com. England & Wales, Birth Index: 1916–2005 [database on-line]. Provo, UT, USA: Ancestry.com Operations Inc, 2008. Original data: General Register Office. England and Wales Civil Registration Indexes. London, England: General Register Office. 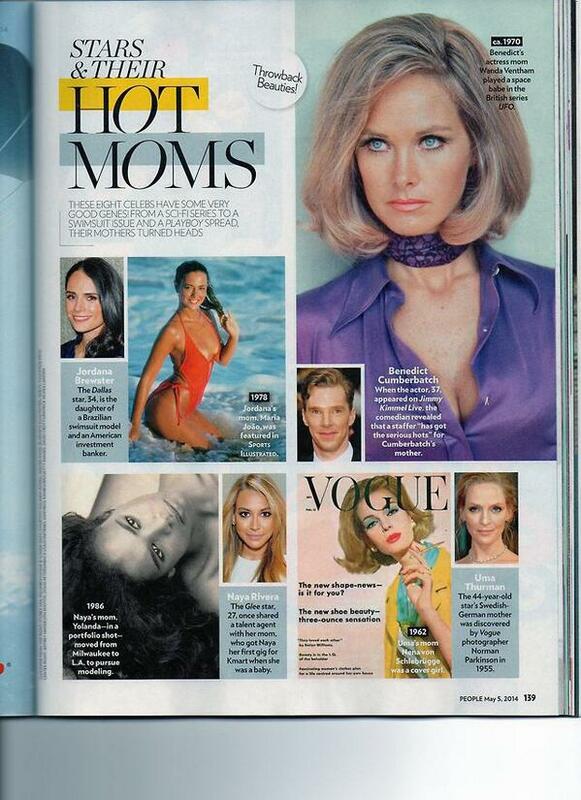 ^ "Stars & Their Hot Moms". People: 139. 5 May 2014. Retrieved 19 June 2015. ^ FreeBMD. England & Wales, FreeBMD Birth Index, 1837–1915 [database on-line]. Provo, UT, USA: Ancestry.com Operations Inc, 2006. Original data: General Register Office. England and Wales Civil Registration Indexes. London, England: General Register Office. ^ a b Ventham, Wanda. Audio commentary for "Timelash". In: The Complete UFO Megaset (DVD). A&E Home Entertainment. 2003. ^ MARTIN, ANNIE (19 September 2014) "Benedict Cumberbatch is 'a true gentleman,' says Judi Dench" . UPI Entertainment. ^ "Benedict Cumberbatch 'so proud' of parents". The Daily Telegraph. 2 January 2014. Retrieved 4 January 2014. ^ Lazarus, Susanna (14 October 2014). "Benedict Mumberbatch! Wanda Ventham to appear on Holby City". Radio Times. Retrieved 1 October 2014. ^ a b Ancestry.com. England & Wales, Marriage Index: 1916–2005 [database on-line]. Provo, UT, USA: Ancestry.com Operations Inc, 2008. Original data: General Register Office. England and Wales Civil Registration Indexes. London, England: General Register Office. ^ Knowles, Stewart (28 July 1979). "Timothy, Wanda... and the rose that changed her mind about marriage". TV Times: 14–15. ^ "TV star Wanda's friendly divorce". Daily Mirror. 13 November 1974. p. 9. ^ Passingham, Kenneth (22 March 1975). "It's good news to know I'm still fanciable". TV Times: 21–22. ^ "Sherlock: Benedict Cumberbatch 'so proud' of parents". The Telegraph. 2 January 2014.